Injen Air Filter Cleaning Kit / Recharge Kit5Steelers FanAugust 25, 2010Kit came on time and was easy to use. Make sure you don't put a whole lot of oil on the filter. The guy when I called in told me that there is enough oil in the kit to do a whole bunch of cleanings and if you overoil the filter it can cause your engine light to go on because it messes up the sensor. I didn't see the warning he gave me on the website so I wanted to help out and let everyone know. Injen Air Filter Cleaning Kit / Recharge Kit5peteSeptember 1, 2009great for recharging K&N type air filters. You don't need to clean Injen filters that often, however when they get too dirty, they can clog up and limit air flow. About every 10,000 miles, you�ll want to oil the air filter with the Injen filter oil, and after 30,000 miles, under normal driving conditions, you�ll need to clean it with the Injen cleaning solution and then re-oil. 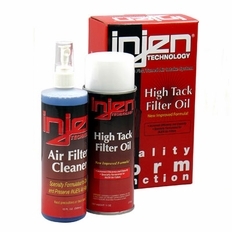 The Injen Air Filter Cleaning Kit comes with both the filter cleaning solution and the filter oil. The cleaning solution is specially formulated, so it won�t damage the filter medium. The filter oil contains a red dye to easily see where the oil has saturated into the filter, eliminating the common mistake of over-oiling the filter. When used correctly, Injen's filter cleaner kit can maintain the life and performance of your Injen filter for long into the future. Cleaning your Injen air filter is easy. Just follow the steps below and you're Injen air filter will be clean in no time! Step 1. APPLY CLEANER: Spray Injen Air Filter Cleaner onto entire surface area of the Injenair filter until it completely saturates the pleated material. Allow Injen Filter Cleaner to soak into the pleats of the air filter for 10 minutes to loosen the dirt. Do not let cleaner dry on air filter. Step 4. OILING: Apply Injen Air Filter Oil liberally to the dirty side (outside) of the filter only. This will allow for a visual reference of complete coverage. A. If using a squeeze bottle, squeeze bead of oil along the crown of each pleat using the lip on the squeeze bottle tip as a guide. If using a aerosol spray, spray an even amount of oil along the crown of each pleat. Wait 20 minutes for the oil to be absorbed into the filter media. Inspect the clean side of the filter for any areas that are lighter in color. Touch up these areas in the media by applying oil to the dirty side of the filter. Continue oiling procedure until there is an even red color over the entire surface of the clean and dirty side of filter. BE SURE NOT TO OVEROIL THE FILTER. The filter should not be soaked or dripping. Over oiling your filter can cause your mass air flow sensor to foul and turn on your check engine light. Step 5. FILTER INSTALLATION: Before reinstalling filter back into vehicle, inspect it for damage. Also be careful to fully tighten and seal your Injen air filter so it cannot come off or allow unfiltered air into the system. Your filter is now oiled and ready for use. Enjoy!